Perched on the toe-end of Italy’s boot, Calabria is a beautiful but poor and isolated province of the country. 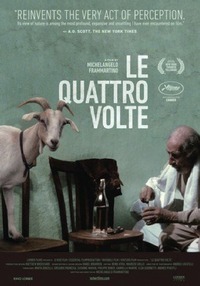 Among the Calabrian hills a nameless old goat herder is coming to the end of his life. Plagued by a worrying cough, his face weathered and his eyes milky - almost worn out from having seen too much - he potters through his routine, leading the goats to and from their high pasture. He takes a strange powder for the cough that, if anything, looks like it might be making things worse. Michelangelo Frammentino’s ‘documentary’ follows this old man’s lonely existence with a patient watchfulness. For the large part silent, there are few words and hardly any music heard; no worries about being distracted by subtitles. The image is all - whether it’s the dust motes that float like miniscule universes in the sunlight falling from church windows, or chiaroscuro images of the old man about his supper, or for that matter the beautiful panoramic shots of the Calabrian countryside, which linger, waiting for a change in the light, or a sudden rush of wind, or for all the goats to go by. There is an elegiac tone set. The old man is passing, and so is the age that made this kind of man possible. The village seems almost inhabited by ghosts, intent only on celebrating odd rituals - a passion play, and some pagan Wicker Man-esque tree climbing ceremony. Watching from a distance, the shots are mostly static. There is one pan, which incongruously reminded me of a motion-triggered surveillance camera. The film appears to long for this world of quietness, where sometimes the only animate things in the landscape are the animals or the leaves on the trees. The old man is by now sitting so still that an ant crawls undisturbed about his face. He seems already to have gone. Despite the sense of loss and the implied criticism of an albeit absent modernity, the film is not without a sly humour. The old man could easily be one of Beckett’s lost clowns, getting into foreseeable mishaps with snails and losing important items while at stool. The animals too seem to have a puckish wit. The faithful sheep dog has a funny run-in with Mary Magdalene, and there are emotional payoffs that, although sad, have the rightness of a cosmic joke. The film moves on from the old man in time to follow a narrative strand which is structured almost like a game of consequences. When first released, Le Quattro Volte received plaudits at Cannes and rave reviews from the critical fraternity, and far be it for me to be the nay-sayer. I enjoyed the experience of being immersed in this quiet world, drifting with the film through the Pythagorean four states (animal, vegetable, mineral and intellectual) to which the title refers. And yet something did nag. I’m not sure if it was the sound of someone singing ‘The Circle of Life’ from the recently 3D-ed and rereleased Lion King. To say the film shares an animism close to that of a celebrated Disney cartoon is perhaps not the damning criticism it might have once been. But I couldn’t help occasionally feeling I was being misled. I grew up in the countryside, and my experience was that the farmers - far from being wistful seers, guardians of the old ways - tended to really enjoy mucking about with engines. Like kicking against someone else’s idea of heaven, I kept wanting to see someone doing something contemporaneously human - like watching a television, or at least owning one. Although no one to my knowledge seriously claims this film to be a documentary, it uses a documentarian aesthetic to convince us of the authenticity of what is, essentially, a sonnet. This review was published on September 25, 2011.